Electrolysis is a form of permanent hair removal that is safe and effective for removing unwanted facial and body hair. With its rise in popularity, electrolysis has provided men and women with lasting results they are sure to tell their friends about. The procedure was invented over 130 years ago in 1875 by Dr. Charles Michael, an ophthalmologist who wanted to come up with ways to get rid of troublesome eyelash hairs. Electrolysis is the only hair removal method in the world that is proven to be permanent. The FDA and the American Medical Association have both stood behind this claim. Electrolysis will begin by weakening and thinning the hair before ultimately removing it altogether. It is definitely a time consuming process but one that is well worth the time once you see the final results. A certified electrologist stretches out your hair follicle and inserts a probe—a tool that looks like a needle. Once the tip of the probe touches the root, the electrologist blasts a tiny electrical current into it which will eventually kill the hair follicle. The probe is then removed from the follicle and the hair is removed with a pair of tweezers. This is done to each individual hair in the treated area. Galvanic: A chemical reaction is produced in the hair follicle in order to kill the growth cells. Thermolysis: Heat is used to kill the growth cells. Blend: This method is a combination of Galvanic and Thermolysis. Electrolysis can be used to treat anyone, regardless of their skin tone, hair color and hair thickness. While getting treated, it is best to refrain from any other form of hair removal so that you avoid strengthening the hairs which will disrupt the treatments. It is common to see scab marks on the treated area after a session of electrolysis. The best way to heal them is to immediately place an ice pack on the area or rinse your skin with cold water. You can also use aloe vera or Neosporin on the affected area in order to speed up the healing process. If you are extra sensitive, using a gold probe rather than a silver will help to greatly reduce scabbing. Ask your electrologist if he/she offers this. Not all will offer a silver probe because they are costly. Although it is possible for an electrologist to damage the skin while using this method of hair removal, it’s not an easy task to do so. Make sure you ask for a test run before undergoing an entire treatment. Electrolysis can be painful. If you feel a lot of discomfort during treatments you can either take Advil or a topical anesthetic to reduce the pain. There is no way to tell how many treatments you will need to see results. However, it is advised that you make weekly or bi-weekly appointments so that the hair in the treated area does not begin to regain its strength over time. The cost of a treatment will vary from one hair removal facility to the next. Most electrologists offer pricing based on time rather than by body part. 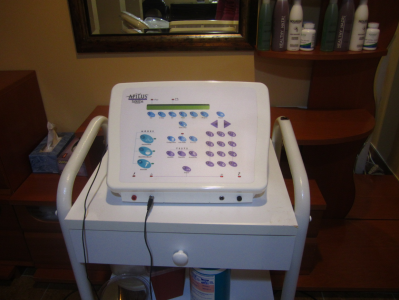 If you are interested in electrolysis for permanent hair removal, contact Laser By Aleya in Long Island.